Description A-769662 is a small-molecule activator of AMPK with EC50 value of 116 nM. Soluble in DMSO > 10 mM. General tips for obtaining a higher concentration: Please warm the tube at 37℃ for 10 minutes and/or shake it in the ultrasonic bath for a while. Stock solution can be stored below -20℃ for several months. A-769662 dose-dependently increases ACC phosphorylation, which is phosphorylated by AMPK. A-769662 inhibits fatty acid synthesis with IC50 value of 3.2 μM. Treatment of rat hepatocytes with A-769662 at concentrations up to 100 μM shows no measurable cytotoxicity. A-769662 significantly reduces the respiratory exchange ratio (RER) throughout the first 3 h, which is followed by a small but significant increase in RER over the subsequent 3 h. A-769662 reduces malonyl CoA levels in rat livers by 33%. A-769662 is a potent activator of AMPK with EC50 value of 0.8 μM in vitro. AMPK(AMP-activated protein kinase) is a serine/threonine protein kinase which is formed by three proteins: α,β and γ subunits. They play important roles in both the activity and stabilities of AMPK. AMPK functions as sensors of cellular energy by detecting and reacting to the change of AMP: ATP ratio. 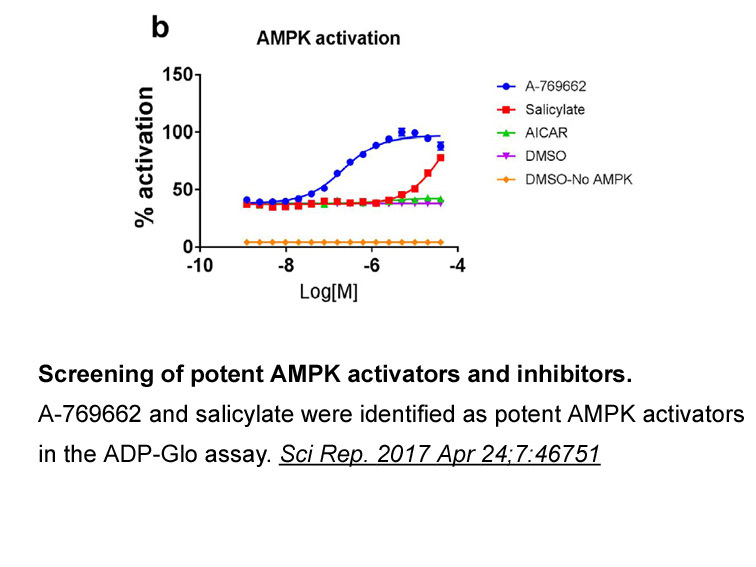 AMPK plays an important role in regulating intracellular energy metabolism. AMPK inhibits ATP-consuming pathways containing cholesterol synthesis, fatty acid synthesisand gluconeogenesis. AMPK stimulates fatty acid oxidation and glycolysis which are ATP-generating processes. AMPK inhibits gluconeogenesis by suppressing the expression of glucose-6-phosphatase and PEPCK wich are two key gluconeogenic enzymes. 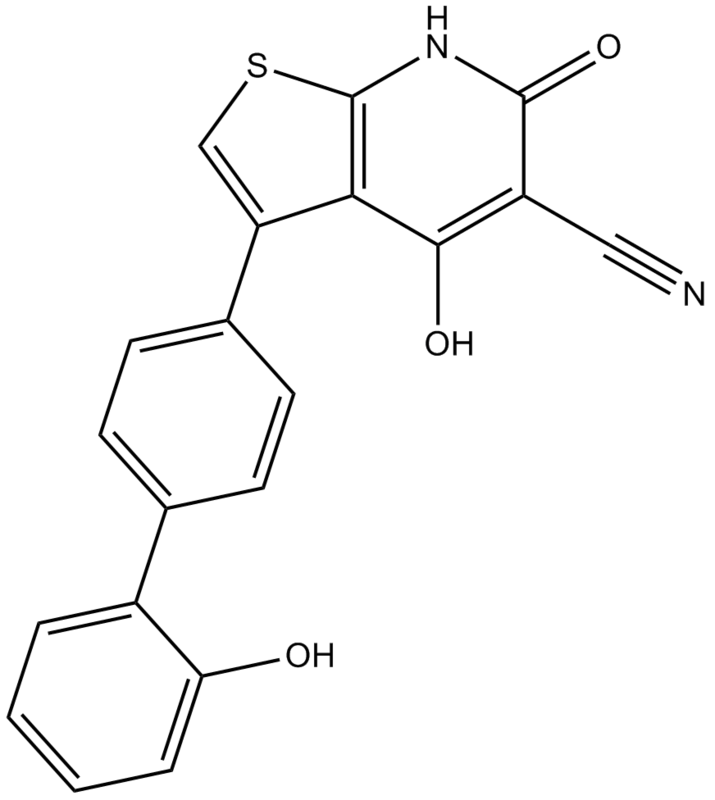 A-769662 belongs to the thienopyridone family. It activates the activity of purified AMPK from diffrent tissues with a dose-dependent manner. 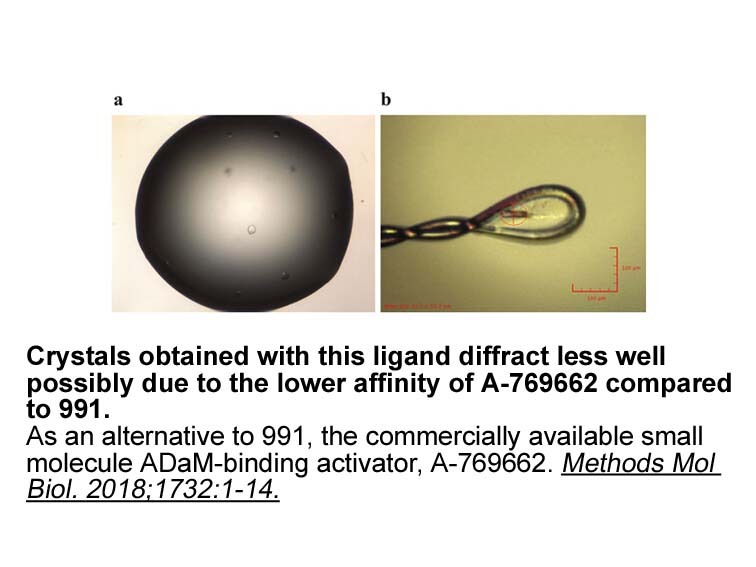 A-769662 activated the activity of AMPK extracted from human embryonic kidney cells (HEKs), rat muscle, or rat heart with EC50 values of 1.1 mM, 1.9 mM, or 2.2mM, respectively. A-769662 inhibited the synthesis of fatty acid with IC50 value of 3.2mM in primary rat hepatocytes. A769662 also has inhibition effect on the 26S proteasome with an AMPK-independent mechanism. A769662 does not inhibit the proteolytic activities of the 20S core subunit which is a novel mechanism. A769662 can cause the arrest of cell cycle by inhibiting the 26S proteasome. A-769662 activates AMPK in an allosterically manner. 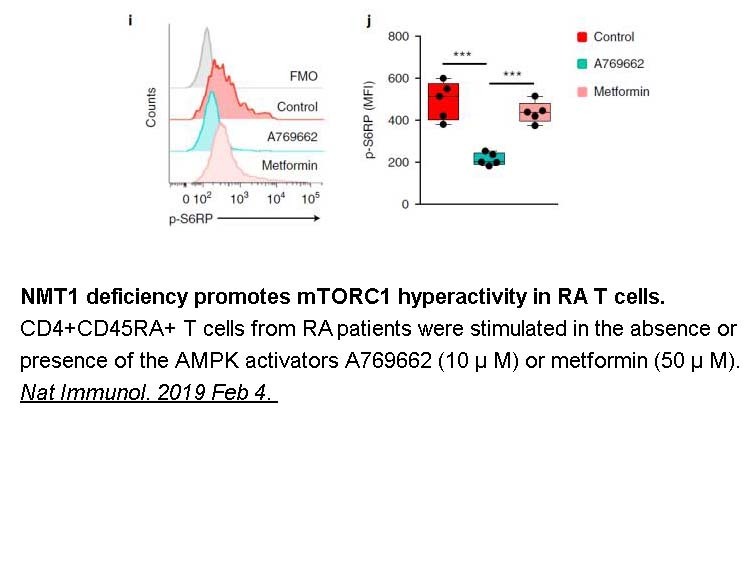 It also inhibits Thr-172 dephosphorylation of AMPK. In mice treated with dose of 30mg/kg, A-769662 decreased the expression of FAS, G6Pase, and PEPCK in liver of. It also lowered plasma glucose by 40% and reduced body weight gain.